A 58-year-old female initially required resection of inferior right parathyroid; its histopathology reported a parathyroid adenoma of 1.5 cm × 0.8 cm. At 3 monthsPostoperative control, presented decrease of calcium from 11 mg/dL to 10.46 mg/dL (RV: 8.8–10.2), and reduction of intact parathyroid hormone (iPTH) from 159 pg/mL to 112 pg/mL (RV: 16–87). The patient had no follow-up for 10 years and did not complain of any symptoms related to hyperparathyroidism. After that, she consults for serum calcium of 11 mg/dL (RV: 8.8–10.2), iPTH of 159 pg/mL (RV: 16–87) and left inferior thyroid nodule compatible with follicular neoplasia, which was diagnostic by neck ultrasonography and fine-needle aspiration biopsy (FNAB). The 99m Tc sestamibi SPECT (single-photon emission computed tomography) parathyroid scintigraphy revealed a possible left inferior parathyroid adenoma [Figure 1]a, [Figure 1]b, [Figure 1]c.
Suspecting an intrathyroidal parathyroid adenoma (IPA), it was decided to perform a 99m Tc sestamibi single-photon emission computed tomography/computed tomography (SPECT/CT), which confirmed an inferior left intrathyroid adenoma [Figure 2]a, [Figure 2]b, [Figure 2]c, [Figure 2]d, [Figure 2]e, [Figure 2]f.
Therefore, according to the findings of the ultrasonography [Figure 3]a, the patient underwent left hemithyroidectomy. 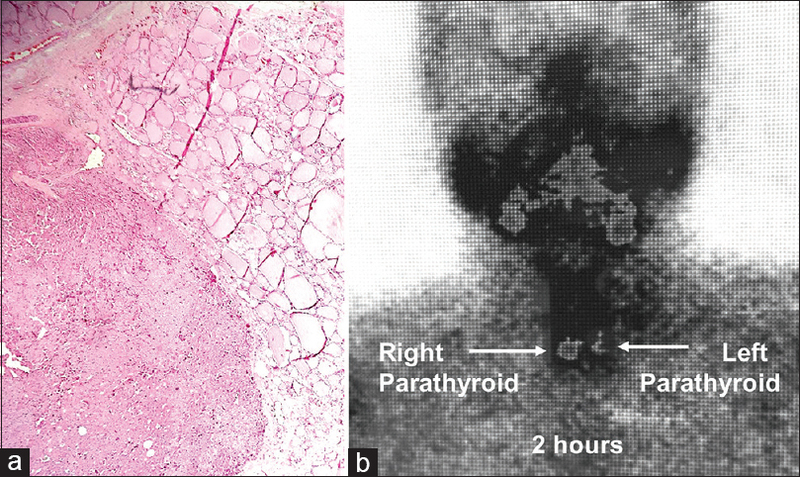 Histopathology revealed an intrathyroidal parathyroid adenoma of 1,2x1,1 cm [Figure 3]b, [Figure 3]c, [Figure 3]d. The 99m Tc sestamibi parathyroid scintigraphy previous first surgery showed unclear uptake of the left inferior parathyroid gland [Figure 4]a, [Figure 4]b. Two years postoperative last surgery, serum calcium was 9.66 mg/dL (RV: 8.8–10.2), ionized calcium was 1.0 mmol/L (RV: 1.12–1.37), and iPTH had a normal level of 50.70 pg/mL (RV: 15–65). In 89% of cases, primary hyperparathyroidism is due to single-gland disease and 9.84% is a multiglandular disease. From this last group, 5.74% is for hyperplasia and 4.14% is for double adenomas. The incidence of IPA is 1.4%–3.2%. For these cases, neck ultrasonography sensitivity and scintigraphy sensitivity are <50%, showing only the second gland in a quarter of cases of double adenoma. In our patient, an inferior right parathyroid adenoma was identified in the first surgery, but the left adenoma was not observed because it was hidden within the inferior pole of the thyroid.99m Tc sestamibi SPECT/CT provides an exact anatomical location of the abnormal glands, especially when they are ectopic., García-Talavera et al. demonstrated that the SPECT/CT has better sensitivity compared with planar imaging (90% vs. 72.5%). We were able to confirm this assertion, once images of 99m Tc sestamibi SPECT/CT accurately located the IPA. To localize a parathyroid adenoma, neck ultrasonography and 99m Tc sestamibi SPECT/CT parathyroid scintigraphy should be performed before surgery. Prasad B, Fleming RM. Intrathyroidal parathyroid adenoma. Clin Nucl Med 2005;30:467-9. Roy M, Mazeh H, Chen H, Sippel RS. Incidence and localization of ectopic parathyroid adenomas in previously unexplored patients. World J Surg 2013;37:102-6. Sung S, Saqi A, Margolskee EM, Crapanzano JP. 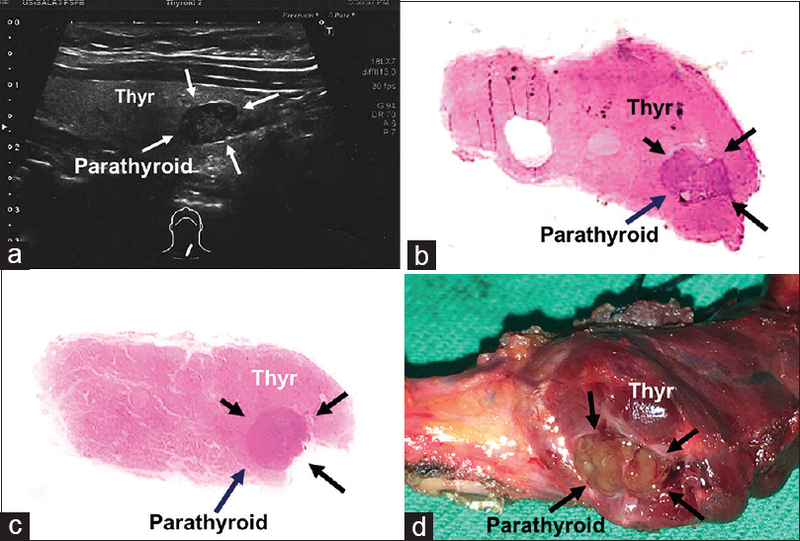 Cytomorphologic features distinguishing Bethesda category IV thyroid lesions from parathyroid. Cytojournal 2017;14:10. Heo I, Park S, Jung CW, Koh JS, Lee SS, Seol H, et al. Fine needle aspiration cytology of parathyroid lesions. Korean J Pathol 2013;47:466-71.